My new novel The Skintaker is released just one month from today! You can pre-order the paperback and ebook from Samhain Horror, Amazon.com, Amazon.co.uk, Barnes & Noble, iTunes, Kobo, Wordery – and wherever horror novels about demonic deities are sold! Read a 5-star rated review of The Skintaker at Horror Novel Reviews – can’t wait to hear what you think of the book. 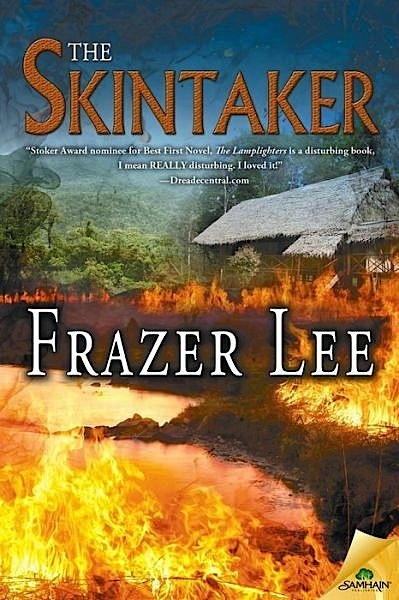 This entry was posted in book news, book trailer, fiction, horror, samhain, the skintaker and tagged book trailer, frazer lee, horror, horror ebooks, novel, paperback, samhain, Skintaker by frazerlee. Bookmark the permalink. I’m currently switching between The Skintaker and The Ice Twins. As a book reviewer there is alwYs something on the pile to be read and reviewed. Good luck with the launch release of Yhe Skintaker Frazer.